I originally wrote this a few years ago. I still agree with it, more or less. Martyn Lloyd-Jones, The Puritans: Their Origins and Successors (Edinburgh, 1987), page 360. Hearing a sermon is not like hearing a lecture. It is your meeting with the living Christ. It is you seeing his glory, so that you can feel it and be changed by it. Let’s pay attention to him and what he means a sermon to be, lest we miss him. 1. I began rethinking what preaching is about the time I began growing disillusioned with the “6 Steps to Successful Yada Yada Yada” I had been fed in church for nearly 15 years. At that time, we didn’t often have to take notes, as a fill-in-the-blank notesheet was usually provided. This many of us would dutifully complete, filling in the missing alliterations, then when the service was over, fold in half, stuff in our pockets, and later find converted back to pulp when the laundry was done. 2. It is difficult for people accustomed to 6 handy steps with accompanying Bible verses to transition to proclamational preaching. I learned this first when preaching this way in a young adult service hosted by an attractional church that preached the other way. There was category confusion. The sermons didn’t seem bullet-pointy, so there was difficulty sensing the narrative. And, honestly, I really stunk at easing the transition. 3. I first began thinking about note-taking in relation to what preaching is when I heard Tim Keller, echoing Lloyd-Jones, say in a sermon, “I don’t mind if you take notes at the beginning of a message, but if you’re still taking notes at the end, I feel like I haven’t brought it home.” I thought to myself then, “Hmmm.” It resonated with me and how I both was experiencing the kind of preaching I found to exalt Christ and the kind of preaching I was trying to get better at. 4. 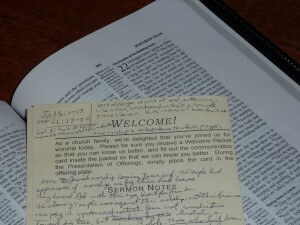 I began discouraging note-taking (not forbidding it) and relieving my church from the duty of note taking (meaning, saying they didn’t have to) because I want them to see preaching in the worship service not as a lecture or as primarily an educational transmission to their minds, but as prophetic proclamation and as primarily aimed at their hearts. 5. Some people have said they process what they hear better when they write things down, and that’s cool. Some people have said being told they shouldn’t take notes if they don’t need to was a huge relief. They now hear better. People are different. I would say if taking notes helps you hear, take notes. If taking notes is simply for memory afterwards, I would recommend not doing so. There is always the sermon audio to refer to, and I provide my manuscript (which usually includes the lines people most want to remember) to anyone who asks for it. 6. My view of preaching is that it is an act of worship for both the preacher and the congregation. The aim of preaching is to proclaim and exalt Christ by proclaiming and exulting in the Scriptures. For this reason, I dissuade note-takers, the same way I dissuade a similar approach to the music time. In worship music, we respond to the gospel by exalting God verbally. In the preaching time, a congregation may not be exalting verbally (although “Amen”s are appreciated, and the occasional awe-inspired gasp is gold :-), but they are not passive in their silence. 7. The preacher ought to do his best on each sermon and preach his guts out in an act of audience-of-One worship, but it is best not to trust one sermon for specific results. Instead, we trust a pattern of and persistence in preaching to have a cumulative effect on the hearts of individuals and in the shaping of a local body. Note-taking is a one sermon act of trust. Just listening and exulting in proclamation trusts that it’s okay to miss some good lines or good points, because it trusts the Holy Spirit to be shaping your heart through the preaching of God’s Word. 8. 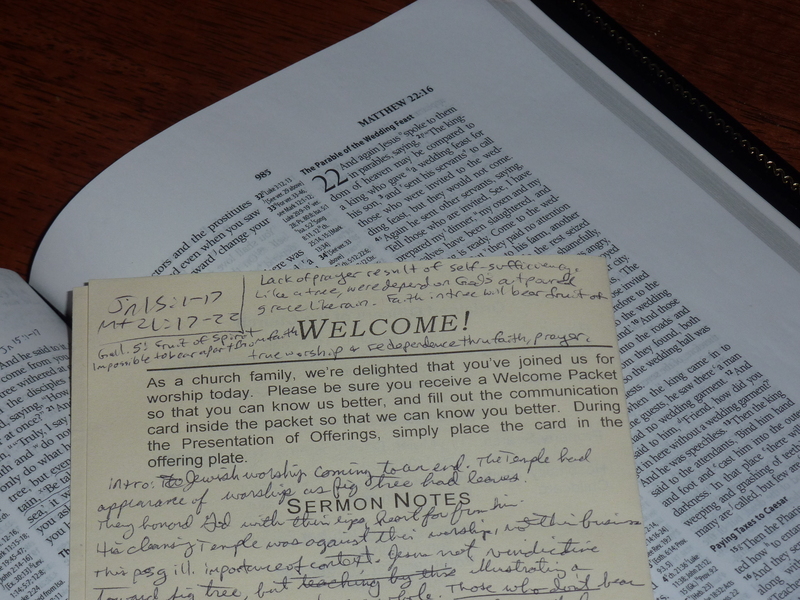 Ditching the note-taking preaching ethos both elevates sermons and properly diminishes them. It treats a sermon as proclamation aided by the Spirit, which gives the sermon a supernatural weight. On the other hand, by treating all words in a sermon as expendable to memory, it puts the preacher’s words in the right place compared to the Scripture’s words. It diminishes the impact of a well-turned phrase and magnifies real revelation.